Many Vermonters in communities impacted by Tropical Storm Irene are reflecting on how far they've come in the five years since the state's worst natural disaster. In late August of 2011, Irene viciously assaulted Vermont, killing six and causing around three-quarters of a billion dollars in damage statewide. In Waterbury, one of the hardest-hit communities, the recovery is still ongoing. Construction is now underway at the Hunger Mountain Children's Center in Waterbury. "The kids will be really happy, and the teachers will be really happy to get into the new space," said Amanda Olney, the executive director of the preschool and child care provider. Hunger Mountain has been working out of temporary space for five years. Now, after half a decade, a more than $1.3-million federal disaster grant is helping Hunger Mountain rebuild and grow. "To move back downtown and to be able to expand our program is really exciting for us," Olney told necn. Next door, the historic state office complex that was ruined in the storm is now back, along with hundreds of workers. There's also a new municipal office, library, and history center in downtown Waterbury. There is, however, still more work to do the town's former offices, which are now vacant and unusable. A downtown church and several houses seeking hazard mitigation upgrades also require work, said Karen Nevins of the group Revitalizing Waterbury. "I would never wish a hurricane or a flood like that on anyone, but what it did was revitalize our community," Nevins said. "If you come to Waterbury today, you'd see we're back, and better than ever." Nevins acknowledged there were some lean years for downtown businesses. Many really struggled, she noted, because of the absence of the state workers. However, with the return of the state workers and upgrades in the downtown district, Nevins said businesses are doing much better today. The community's proximity to Stowe and reputation as being a good place to check out craft beers has also helped draw visitors, she said. At Waterbury Sports, co-owner Chuck Hughson said he's glad to be a part of the community's rebound. "Waterbury is a great place to be," Hughson said. "This is known as one of the recreation capitals of the state, so it makes perfect sense for a sporting goods store to be here." 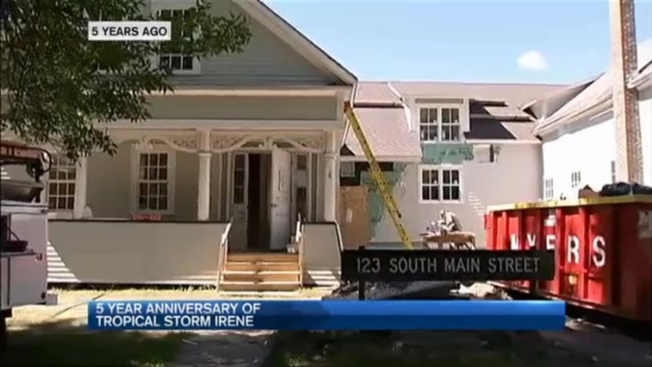 Hughson pointed out that for many in Waterbury, the memory of Irene is never far from mind, since several buildings have high-water marks from the 2011 storm. "Us being in the flood plain still, it's not something that doesn't cross our mind when we see there's a big storm coming," Hughson said. Waterbury is holding a party this Sunday to mark the Irene anniversary. It's a community-wide picnic from 1-3 p.m. on the lawn of the state offices.